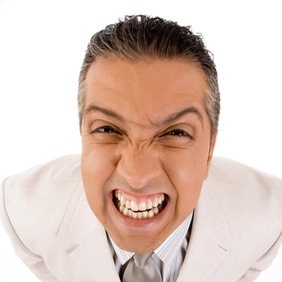 Bruxism is a fancy word for grinding your teeth. Bruxism during sleep is common in children, especially when teeth are growing in. Most children outgrow it. For adults, bruxism can occur at night or during the day. Many people who grind or clench their teeth don’t realize they are doing it. Teeth grinding can wear down your teeth, cause jaw tension and cause or increase headache pain. If you grind your teeth, you can prevent tooth damage and even relieve pain by identifying the cause of your teeth grinding and trying to find a solution. Here are three causes of teeth grinding. Sleep apnea is a sleep disorder in that blocks the airways, making it hard to breathe and actually stopping breathing. Teeth clenching can occur while a sleep apnea sufferer is asleep. This happens because the body is attempting to keep the airway open by stiffening muscles to keep the airway from collapsing. Chronic fatigue caused by sleep apnea can also increase emotional stress, which can lead to daytime teeth clenching or grinding. If you take antidepressant medications, you are not alone. Millions of people are prescribed antidepressants, and while they are effective, they have some side effects including bruxism. Specifically, the common class of antidepressants called SSRIs has been associated with bruxism. Teeth grinding has also been linked to smoking and excessive alcohol consumption. If smoking or drinking is used to try to relieve stress, teeth grinding could actually get worse. The most effective treatment for teeth grinding often involves behavioral or lifestyle changes. Quitting smoking, reducing alcohol consumption and taking steps to get good sleep can help. If eliminating some causes of teeth grinding, such as prescription medications, is not possible, a physical dental treatment could help. Call our Chicago dentist and ask about a custom mouthguard that can protect your teeth from the effects of grinding. Eliminating teeth grinding could improve your oral health, reduce facial tension or headaches and give you more reason to smile.